A long time ago, we rented a movie. Big Night. Until Chef came out, Big Night was the foodie movie. We were drooling and starving at the end, and I got into my head the desire to make the movie's ultimate dish: the Timpano (or Timballo, depending on where you're from in Italy). The recipe was difficult to obtain, none of the sources were legit. Until last year, when my husband presented me with The Tucci Cookbook, a collection of recipes from Stanley Tucci. It included, in great detail, the Timpano. I studied the recipe in detail, planning my attack. Today, after over a decade of dreaming and months of preparations, the dream finally realised. I made the ragù sauce months in advance, freezing the portion I needed and eating the rest for dinner just like suggested. Then, one night I rolled tiny meatballs, also to freeze for the Timpano. I sent my husband to Eataly downtown to procure bags of Ziti pasta imported from Italy, and this morning I made my final stop: Josef's in Geneva for Genoa salami and Provolone cheese. I told a very round, very pleasant, Italian butcher what I was making and he knew exactly how I needed everything sliced (1/2 inch thick to make cubes). I have a feeling he makes Timpano every weekend, the word just bounced off his tongue perfectly pronounced. Of course leave it to Danny to find an enormous bag of prawns among all the meat and fresh pasta in their freezer. My husband also discovered Irish bangers, so we'll be back. Danny said he has to be back for the shrimp. I kicked everyone out of the house once we got home. I was nervous, I had to make the dough. Doughs and I do not get along. It's either too sticky or too dry. But, Saint Lorenzo (the Patron Saint of cooks) was on my side this time, and it turned out perfect. I rolled it out 1/16 inch thick and said a prayer before carefully lining an enormous and heavy LeCreuset dutch oven with it. Tucci has a special Timpano pan, they used it in the movie, I think you can only get it in Italy. It's on my list of things to get when I go over there. Before the Murano glass and shoes. I halved the recipe. The original serves 16 people. I still had enough filling left over to fill a large baking pan and make baked (and over-stuffed) ziti. Which I will freeze like a proper Italian housewife even though I'm Russian. I was actually worried when the heavy LeCreuset went into the oven. But, 1.5 hours later, it came out looking golden and promising. I popped ziti into the oven and set the timer for 30 minutes, enough to cook the ziti and cool the Timpano. The timer ticked so loud, we started making jokes about ticking car bombs. The timer's Italian as well, by the way. When it shrieked loudly at the end of 30 mins, I ran to the stove. Tucci said to gently shake the pot, the Timpano should swirl around to indicate that it was not stuck to the sides. I shook, it spun in a little circle. I started jumping for joy. Did I really manage to make this? 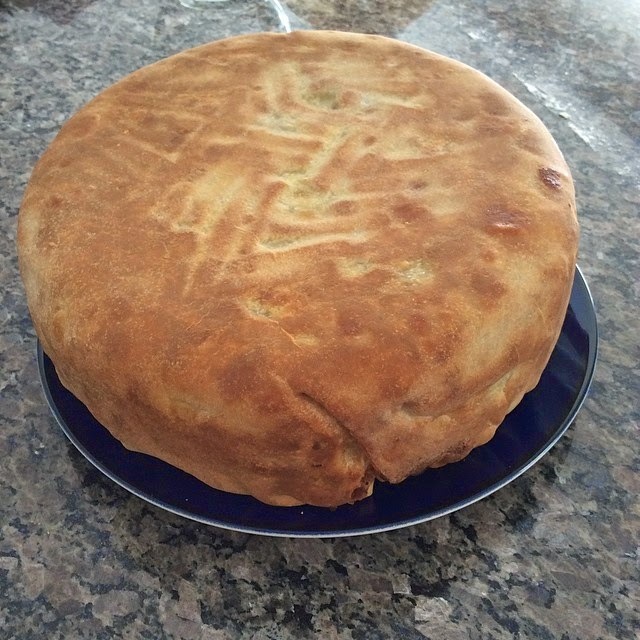 We flipped the pot over (a very hard task considering it is heavy as hell empty and nearly impossible to lift when full), and the Timpano sat firmly on the plate while I gently lifted the pot off. Perfect! We did the sound test, just like in the movie, by tapping on the side and listening for the dull drum sound. I have finally fullfilled my culinary dream. It's delicious and filling but you still go for another slice. It's not heavy, there is still room for desert. But somehow I feel empty now that I made it, the challenge is gone. I have made Coq au Vin, Boeuf Bourguignon (Julia's Boeuf Bourguignon) and now this. I will now have to find another culinary dream to conquer. Perhaps molecular gastronomy? Nah, I prefer my food to actually look like food when I plate it.